With a hand mixer or stand mixer, blend the corn syrup and margarine together until creamy, add in the vanilla and salt and blend again. Carefully add the powdered sugar 1 cup at a time and mix until creamy and smooth. Divide ⅓ of the filling out and color with yellow food coloring. Wrap both colors in plastic wrap and refrigerate while you make the chocolate eggs. 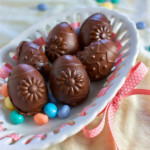 With a pastry brush, coat the sides of the egg molds with a thick coating of chocolate. Allow the chocolate to harden completely and remove from the molds. Add a spoonful of white fondant and some yellow fondant inside one half, brush or pipe some melted chocolate around the edges of the egg and add the other half, using the chocolate as glue. Trim the edges to make them pretty. See my post on dairy-free butter alternatives if you need sources.